The College is delighted that the 2018 major projects for Dylan for Visual Arts and Zachary for Industrial Technology have been selected for exhibition. We congratulate Blake (Year Twelve 2016) on receiving a nomination for inclusion of his HSC Visual Arts body of work in ArtExpress. 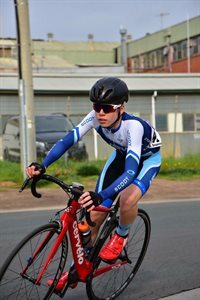 Joshua (Year Eight) won a silver medal for NSW in the Australian National Junior Road Cycling Championships in Bendigo. Harrison's (Year 6) Little League World Series baseball team won their game 3-1 against Europe-Africa making a first in Australian history to win an opening game in the series. Following Kaitlyn T's (Year 7) beautiful performance at the White Ribbon Breakfast in 2015 with Collegian, Cassidy-Rae Wilson, she was invited to perform at the inaugural Lisa Harnum Benefit at Castle Hill RSL. Kaitlyn’s self-choreographed contemporary lyrical dance to Cassidy-Rae's song was a highlight of the evening. We congratulate Kaitlyn on as an outstanding ambassador for the College with such a passion for dance. Alexandra M (Year 6) who was named as the competition winner for naming the Norwest Rail Link Tunnel Boring Machine "Elizabeth" after Elizabeth Rouse of Rouse Estate. Lachlan G (Year 4) who has been invited to represent the College at the NSW State Snow Sport Championships a Thredbo in August. Georgia R (Year 8) who, with her partner, Kira, won a gold medal for Australia at the Indo Pacific Championships and now enjoys the title of U17 Womens Syncronised Indo Pacific Champion! Jordan C (Year 8) who made a NSW representative baseball team competing in St Louis, USA, later this term. Shaun T (Year 2) who has recently achieved his Black Belt in taekwondo. Tayla M (Year 9) who won a Scholarship for one week at the Whitehouse based on her amazing design skills. AJ C (Year 9) who has been selected to participate in Basketball NSW's Talented Athlete Program. Alana Z (Year 6) who has been selected to the Combined Independent Schools Netball Team.